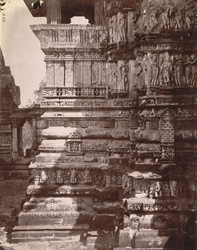 Photograph of a close view of a wall showing sculptural details of Chaturbhuja Temple, Khajuraho, Madhya Pradesh from the Archaeological Survey of India Collections, taken by Joseph David Beglar in 1871-71. The Chaturbhuja Temple from the 12th century is a fine temple of the Chandella style. The sanctuary and the porch are raised on a terrace and the slender spire has clusters of smaller towers rising towards the amalaka and pot finial. The outer walls are richly decorated with sculptures and scrollworks and foliation.